Brooklyn Orchids 2018 Calendar Now Available! Hello orchid lovers! I wanted to let you know that the Brooklyn Orchids 2018 Calendar is now available in my Zazzle store. The calendar contains original photos of orchids taken by yours truly at a variety of orchid shows and displays over the years. My calendar measures 8.5″ x 11″ and lists American holidays throughout each month. It’s a great gift for orchid fans, or you can treat yourself to one! I know I’ll buy a calendar for myself, as I do every year. The calendar costs $24.90, but Zazzle very frequently offers promo codes with varying discounts. There is currently a 20% off sitewide discount when you use the code ZAZZLETWENTY at checkout (promo ends at 11:59pm PT on November 19). And they typically offer promo codes for Black Friday and Cyber Monday, so if you’re planning to participate in the post-Thanksgiving shopping frenzy (I’m not judging…we all do it), that would also be a great time to buy your Brooklyn Orchids calendar! Just a quick note: I haven’t updated much lately because there’s not a whole lot going on with my orchids. I hope that changes soon! As always, thank you so much for reading and supporting my little blog. I hope all of your orchids are happy and healthy! 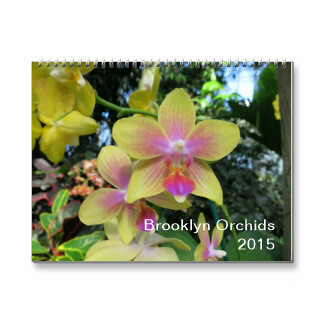 Cyber Monday Sale: 65% off Brooklyn Orchids 2015 Calendar! The above-mentioned coupon code will also get you discounts on a slew of other Brooklyn Orchids goodies today: 50% off of cards, 40% off of mugs, 30% off of gadget cases, and more. Ah, Cyber Monday: holiday shopping at its finest. Thank you in advance for all of your support of my little blog endeavor! The mercury has dipped—for real, it’s 27°F with howling wind in Brooklyn right now—and along with the chilly temperatures comes a ton of of eating, drinking, and, of course, holiday shopping. If you’re looking for a holiday gift for yourself the orchid lover in your life, why not snap up a Brooklyn Orchids 2015 calendar or two from my Zazzle Store? The calendar is filled with twelve months’ worth of original orchid photographs by yours truly and will brighten up any office space year round. Regular price is $23.10, but Zazzle is currently running a 15% off deal, so you’ll only pay $19.64 per calendar when you enter the coupon code TISTHESEASON at checkout. The code is valid through this Friday, November 21st, so now’s as good a time as any to start your holiday shopping! The Brooklyn Orchids Zazzle Store also has a ton of other goodies with my orchid photos printed on them, including thank you note cards and stamps that you know you’ll need after this holiday season’s gift-giving frenzy.